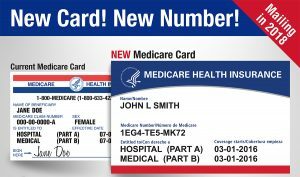 To better protect seniors from medical identity theft, the Social Security Administration will be issuing new Medicare cards – without the Social Security number – to all Medicare beneficiaries starting in April. The Social Security number will be replaced by a Medicare number, unique to each beneficiary, and used only for Medicare coverage. Cards will be mailed between April, 2018 and April, 2019. Be sure your mailing address is up to date. If it needs to be corrected, contact Social Security at ssa.gov/myaccount or 1.800.772.1213. TTY users can call 1.800.325.0778. Beware of anyone who contacts you about your new Medicare card. Medicare will never ask you to give them personal or private information to get your new Medicare Number and card. Remember, never give out any personal or private information over the phone. Be patient. As this is a major change, it will take some time to complete this transition. The new card won’t change your Medicare coverage or benefits. The effective date of the new card is the date you were eligible for Medicare. Additional information will be provided when you receive your card.